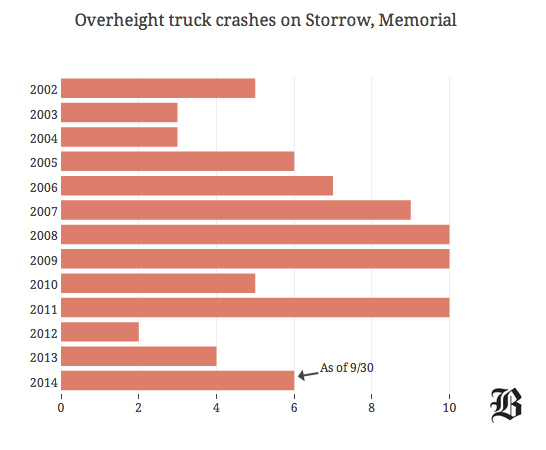 The number of trucks that have become stuck under bridges along Storrow Drive in Boston and Memorial Drive in Cambridge so far in 2014 has surpassed the total number in 2013. In recent years, the majority of the crashes have occurred in Boston near Longfellow Bridge, based on an analysis of data from the Massachusetts Department of Transportation stretching back to 2002. But historically, more trucks have crashed into the overhead structure underneath Massachusetts Avenue on Memorial Drive in Cambridge. Overall, the total has gone down since 2011 which saw 10 overhead crashes with bridge structures. 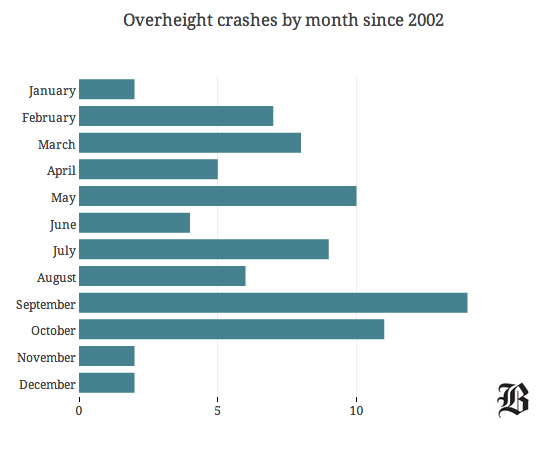 The top month with the most overheight trucks collisions is September, followed by October and May. Swipe through the map below to browse photos of bridges and signs warning oversized trucks to not enter.